Germany is investigating who leaked an arrest warrant for an Iraqi suspect in a stabbing case to far-right groups, a case that triggered violent protests. 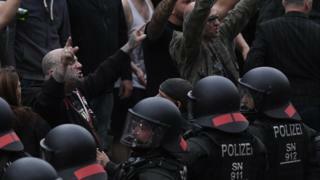 Thousands joined a far-right rally in the eastern city of Chemnitz on Sunday after the fatal stabbing. The unauthorised disclosure has increased concerns of possible links between police and anti-migrant groups. 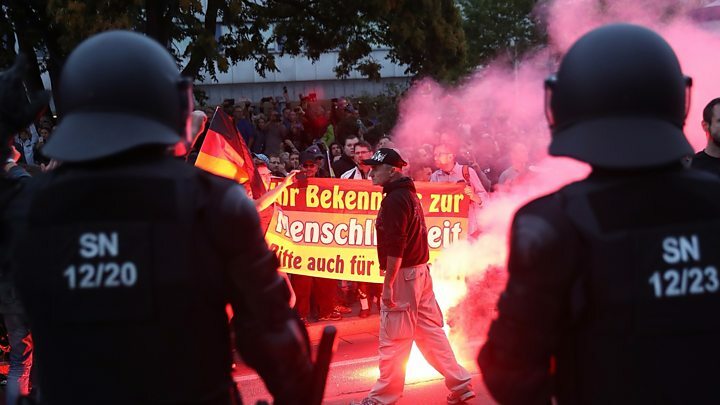 Chemnitz is braced for fresh protests on Thursday, with local authorities calling in federal police to help. Police have also opened 10 cases against far-right protesters who gave the illegal Hitler salute during the first day of unrest. In a separate incident, police are hunting three men after a migrant in the northern city of Wismar was subjected to xenophobic insults and beaten with a chain on Wednesday evening. The victim suffered a broken nose and bruises to his face and upper body, investigators said. A Saxony official called the leak of the arrest warrant - most likely from a police or judicial source - a scandal. "We have a bigger problem to deal with there," said Martin Dulig, the state of Saxony's deputy premier, to German media. The disclosure, which led to the warrant being published on far-right websites, is highly unusual in Germany which has strict rules for judicial proceedings. The 22-year-old Iraqi man and a 23-year-old Syrian were arrested and charged with manslaughter on Monday. The leaked warrant for the Iraqi suspect revealed details of the number of stab wounds as well as the full names of suspects, the victim, witnesses and the judge. It also contained the Iraqi's address. Critics believe it may have been leaked to further incite anti-immigrant sentiments. In the early hours, a fight broke out between "multiple nationalities" on the sidelines of a street festival, police said. The stabbing victim, a 35-year-old carpenter named Daniel H, was critically wounded and died in hospital. It remains unclear what triggered the brawl, but police dismissed online rumours that the victim had been defending a woman from sexual assault. Two other German men with him, aged 33 and 38, were seriously hurt, police said. A half-Cuban woman who grew up with Daniel H, Nancy Larssen, told Deutsche Welle news that media misreporting had helped fuel the "horrible" far-right protest. Another friend of Daniel H, quoted by the Chemnitz news site Freie Presse, described him as left-wing, with a seven-year-old son. News of the incident involving migrants, reinforced with the leaked arrest warrant, incited hundreds and then thousands of right-wing extremists and sympathisers to take to the streets. On Monday, some 6,000 took part in a far-right demonstration, while 1,000 people gathered in a rival anti-fascist rally, police said. Several people were injured as fireworks and objects were hurled on both sides. Freelance journalist Johannes Grunert told Spiegel Online he had witnessed some protesters using bottles to attack people "who did not look German". Local authorities have come under fire for failing to contain the situation - with a police spokesperson conceding they had not initially deployed enough officers. Saxony Interior Minister Roland Wöller said far-right activists had quickly travelled to Chemnitz not only from other parts of eastern Germany but also the capital Berlin and the western regions of Lower Saxony and North Rhine-Westphalia. Chemnitz is in a region where the far-right, anti-immigration Alternative for Germany (AfD) party and the Pegida movement are particularly strong. Both groups, along with another local right-wing group called Pro Chemnitz, have reportedly called for more protests on Thursday and Saturday. What does the government say? German Chancellor Angela Merkel has repeatedly condemned the far-right protests, in which several foreigners were chased and injured by violent participants. "Hate in the streets," she said, "has nothing to do with our constitutional state". Michael Kretschmer, the premier of Saxony and a close Merkel ally, has vowed to deal firmly with extremists in his state. "The fact that we have a Syrian and an Iraqi suspect is no reason - no reason at all - for a general suspicion of all foreign residents," he said. The protests have exposed deep divisions in German society over the influx of more than one million migrants, mostly Muslims fleeing Middle East conflicts, after Chancellor Angela Merkel's decision in 2015 to let them in. However, the number of people seeking asylum has fallen steeply. Nonetheless, right-wing groups such as the AfD - which entered parliament for the first time in 2017 with 12.6% of the vote and 94 seats - deplore Mrs Merkel's liberal immigration policy. Migrants in Germany: Should they be paid to go home?